Teen Health Week, an annual week-long designation to raise the profile of adolescent health, will be celebrated globally this year (for the first time) from March 18-24, 2018. We spoke with Dr. Laura Offutt, a physician and teen health advocate, about how she started the event and what is planned for this year. For more information on Teen Health Week, be sure to visit www.TeenHealthWeek.org . Q: How did Teen Health Week get started? 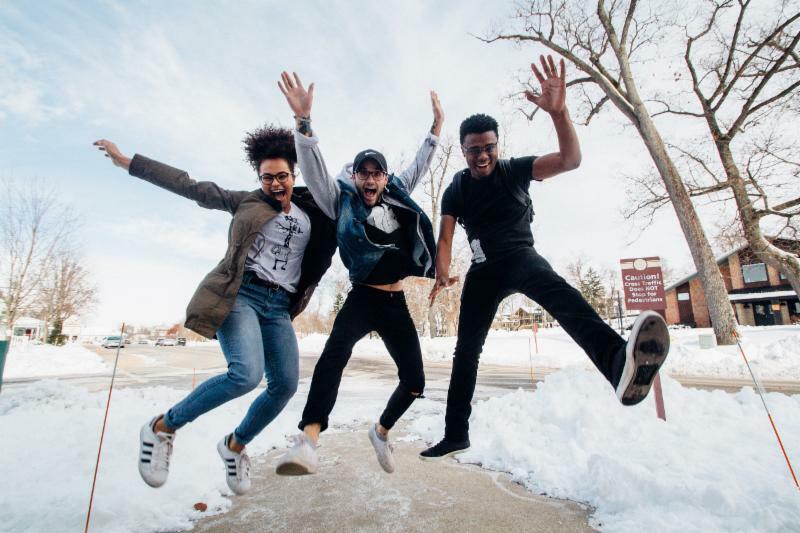 Dr. Offutt: The idea for a Teen Health Week occurred to me the summer of 2015 when I was working with a group of youth advisors who were helping me improve Real Talk with Dr. Offutt (my digital teen health resource). I realized that although there are specific observances for specific teen-health topics (Teen Dating Violence Prevention Month), there was no observance that focused on the holistic aspects of teen health. While so much health communication to this age group is fear mongering and preachy (and in turn, ineffective), I thought health should be fun – after all, what is more enjoyable than feeling and staying well? 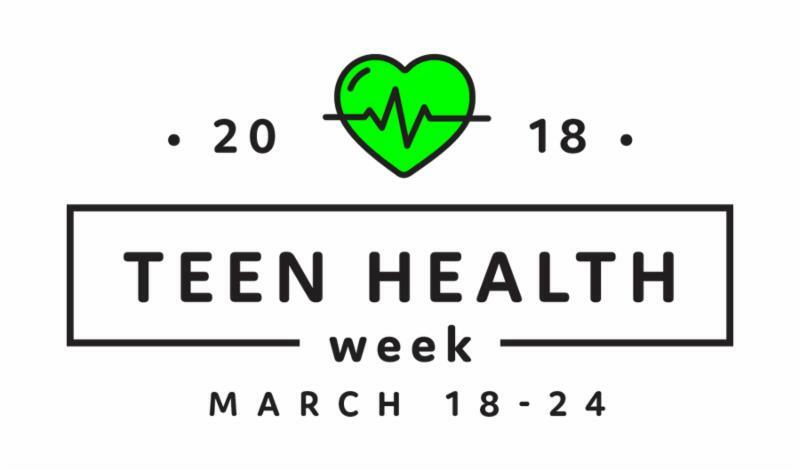 Putting together a week that felt more like a celebration (lime green spirit wear, youth planning and engagement) captured what I love about health and encouraging others to be healthy as a physician. It also had the potential to inspire young people to be more engaged in their own health and to learn to advocate for themselves. Q: What themes and activities are part of the 2018 Teen Health Week? Dr. Offutt: One of the best parts about this event is how different participants are making Teen Health Week their own. Around the world there are events such as: a yoga/mindfulness kickoff party, a fun-filled gathering for high school students about Teen Mental Health, a substance abuse panel, many assemblies and guest speakers, a Teen Summit for local schools through a medical system in Nigeria, a theme-based educational event at a school in western Hungary, and the list goes on! Participating regions are highlighted on our global map . ﻿The following are suggested themes for each day of Teen Health Week, although individual organizations are invited to focus on one that is in line with their mission. The themes are: Violence Prevention (Sunday, 3/18); Preventive Care and Vaccines (Monday, 3/19); Healthy Diet and Exercise (Tuesday, 3/20); Mental Health (Wednesday, 3/21); Sexual Development and Health (Thursday, 3/22); Substance Use and Abuse (Friday, 3/23); and Oral Health (Saturday, 3/24). Q: How does health care transition fit into Teen Health Week? Dr. Offutt: Health care transition is an important aspect of Teen Health Week. One of the main goals of the week is to engage adolescents in their own health, and providing them the tools they need to decide when and how to transition from pediatric to adult care is a critical aspect of their health self-advocacy learning. Preventive Care is one of the week’s 7 themes, and we have incorporated Got Transition resources and information into the Preventive Care and Vaccines toolkit. For example, a suggested activity for older teens in health class is for them to think about when they might be ready to transition from pediatric to adult care by completing the Health Care Transition Quiz in class. Q: After Teen Health Week, what can individuals/organizations do going forward to advocate for these teen health issues? Dr. Offutt: We hope that Teen Health Week will be a good opportunity for organizations to pilot initiatives that they will then roll out to a larger audience. At the most basic level, Teen Health Week ideally inspires young people to ask for help, ask questions, and advocate for their own health, which would not end based on a calendar. Health experts can reach out to and inform government officials about teen health issues, shaping policy that affects our youth. It would be wonderful if schools are inspired to start Teen Health Week clubs where young people can plan for future Teen Health Weeks and be peer health leaders in their school communities. In the end, we hope that Teen Health Week draws greater attention to the need for a broader focus on adolescent health and wellness around the world. The transition from pediatric to adult health care is a critical time in the lives of millions of young adults. To engage young adults in their health care transition, Got Transition and its National Young Adult Transition Advisory Group have developed a social media toolkit to promote its new Health Care Transition Quiz, “ Are You Ready to Transition to Adult Care? ” The quiz asks key questions to help young adults prepare for changes that happen usually between 18 and 22. The quiz includes tips and linked resources to support young adults to be self-advocates. These resources include information on how to add medical information to a smartphone, what legal changes occur at age 18, how to sign up for health insurance, and more. To promote the Health Care Transition Quiz and Got Transition’s website ( www.GotTransition.org ), the Young Adult Social Media Toolkit includes sample newsletter text, Facebook posts, Tweets, and youth-friendly memes (to be incorporated into Facebook or Twitter posts). We encourage you to incorporate these samples into your social media and other media platforms. 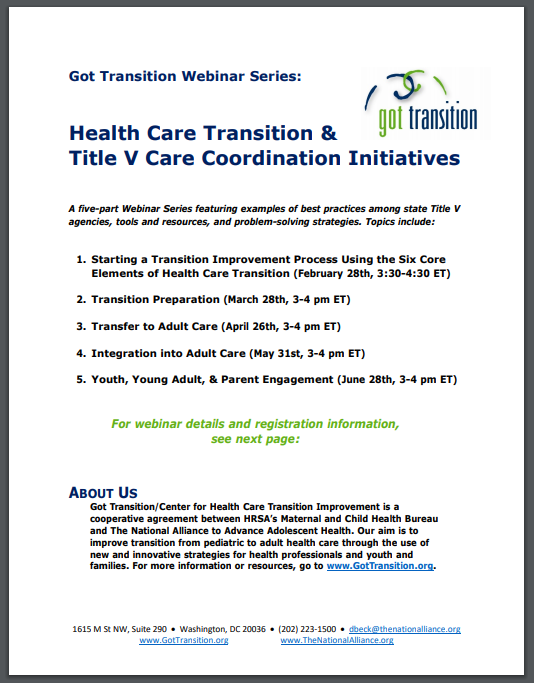 Registration is now open for Got Transition’s five-part webinar series on Health Care Transition & Title V Care Coordination Initiatives . The series features state Title V, clinical experts, and young adult leaders who will provide examples of best practices among state Title V agencies, tools and resources, and problem-solving strategies. The first session, "Starting a Transition Improvement Process Using the Six Core Elements of Health Care Transition," laid the groundwork for creating an evidence-driven approach to health care transition, building on Title V’s rich history in care coordination. 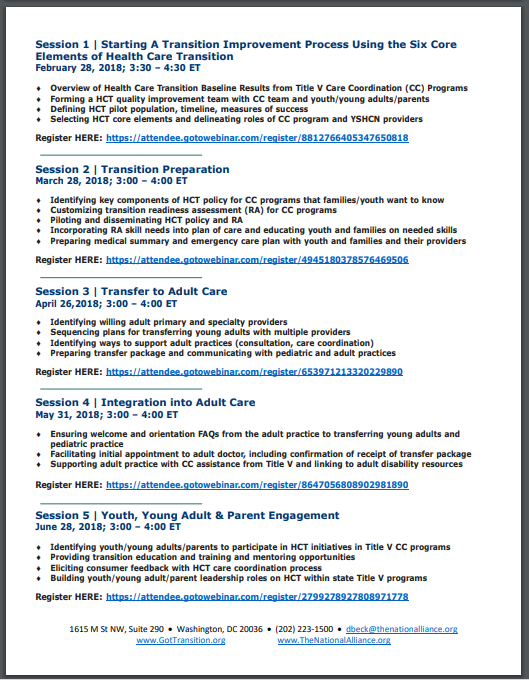 Additional session topics will include: Transition Preparation (March 28th, 3-4 pm ET); Transfer to Adult Care (April 26th, 3-4 pm ET); Integration into Adult Care (May 31st, 3-4 pm ET); and Youth, Young Adult, & Parent Engagement (June 28th, 3-4 pm ET). Be sure to visit our Webinar page for registration information on upcoming sessions, as well as the recording and handouts from the first webinar session. 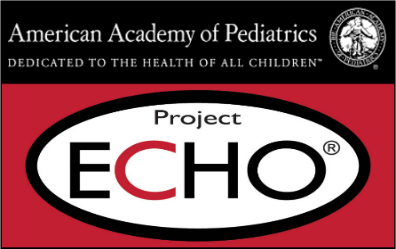 The American Academy of Pediatrics (AAP) and Got Transition collaborated on a series of 7 ECHO virtual community sessions for the Bureau of Maternal and Child Health’s (MCHB) Epilepsy grantees and other health care professionals on incorporating health care transition from pediatric to adult-oriented care into their practice. Each of the 7 sessions includes a case, a brief didactic slide deck, and a discussion. Topics include how to begin a transition process, how to find and partner with adult providers, how to engage families, and more. Click HERE for the 7 sessions and additional transition resources. 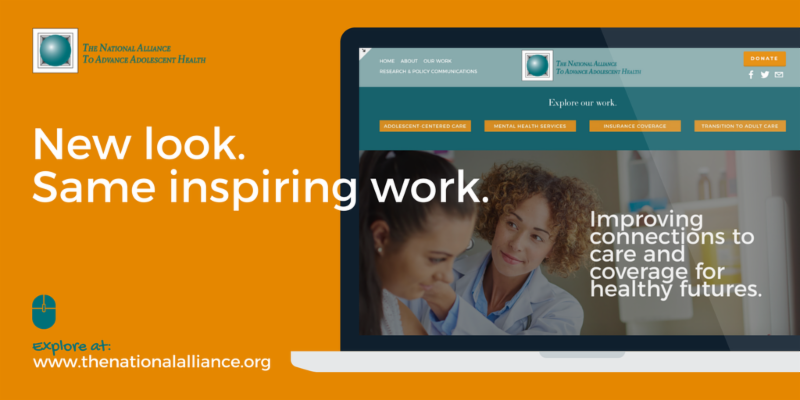 The National Alliance to Advance Adolescent Health, which runs the Got Transition program, is proud to unveil its newly-updated website . The site includes research, policy communications, and other resources on a host of adolescent health issues that include adolescent-centered care, mental health services, insurance coverage, and health care transition. Please visit www.TheNationalAlliance.org for more information.